Frame - Front trusses in ASD tubular steel securely fitted with traction screws with aluminium alloy casting rear section. Whenever the Italians design a new bike or car it usually creates a stir from the public and the press. Italian design is always different and the Benelli Tornado RS certainly lives up to this tradition! I saw the Tornado previewed some years ago and read about the mixed reactions it had, so finally I managed to get hold of one for a real road and track test to see what all the fuss was about. There are a lot of top end sports bikes in the world, not just from the Japanese, but from the UK, Italy and now Germany too. So is the Benelli that different from the others, would it get noticed in a crowd? I made the trip down to Three Cross motorcycles in Dorset to collect the RS, it was a warm sunny day and there I was going by car and trailer to get it. Why can't I ever get it right, it always rains when I go to get Harleys by bike, still the forecast was good for the next week or so, maybe I would get to really try it out? My question about the Benelli getting noticed was soon answered on the way back. Within 10 mins of leaving it was surrounded by onlookers at the first set of lights in the local town, it was the start of a pattern! Everywhere I went during the course of the following 10 days was the same, the Benelli turned heads and that's frankly a hard task these days with all the good looking bikes on the market. Even non-bikers stared from the cosy air-conditioned comfort of their cars. Maybe it was jealousy as I weaved past them in traffic, maybe they all looked at bikes this way, but I still found my way to the front of the queue and still had the looks as I pulled away leaving them all fumbling for a gear! 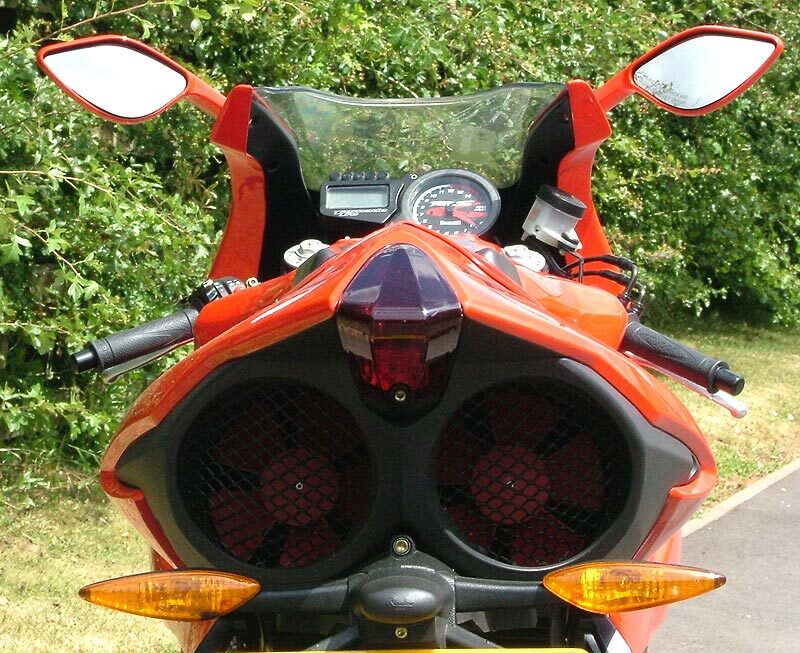 The big giveaway with the Benelli RS is those fans in the tail, talk about making people stare and become speechless, a quick prod at the person next to them and then the reaction - What the ****'s that? You can just imagine what they're saying, it just makes you laugh when you ride by. Of course on the RS the fans are red to go with the rest of the bike, but on the Tre they are yellow, just to make them stand out even more. Let's face it, in black it just wouldn't have been the same! After a couple of days riding it was time for the annual pilgrimage to Silverstone for World Superbikes, 3 days of bikes and racing, brilliant! This year I was parked in the race paddock with the Benelli, irony in itself as they are not eligible to race now. Why? 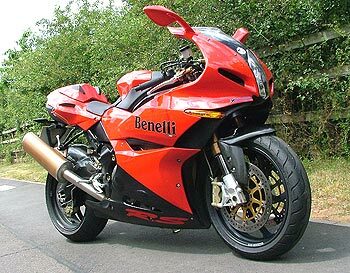 The World Superbike rules changed and the Benelli was built to comply with the old rules, 750cc four cylinder, 900cc three cylinder and 1000cc twins. But now it's 1000cc for bikes, and that means a major redesign if it's going to race again. And in my mind race it should. Riding solo and two-up for a few days both in town and out on the ordinary roads gave a first verdict on the bike. When parked up outside a cafe, it's a real attention magnet, and getting there was a ballistic experience on any road! With race bike equipment, handling and comfort it's not the easiest bike to ride a long way but it rewards you with supreme feel and feedback, and wow does it cover the road at a respectable pace! If that isn't enough, whenever you turn up at your mate's house they always come out to greet you with the words "Well I heard you coming around the corner, it makes the whole room shake' It's good to know you've arrived! So what's it really like to ride? Fire up the motor and it rattles a bit, then settles down to a low groundshaking rumble, a bit like my old Triumph Daytona T595, in fact a lot like it, but that's where the similarity ends though. It may well sound the same casually idling on it's side stand, but slip it into gear and ride off and then you see the real differences! The engine response is excellent and it pulls 'turbine like' from nothing right up to the top end with smooth power delivery and tons of torque. The cassette gearbox is very slick and quickshifting through the box without the clutch is just a delight. Changing down is easy and effortless to with the adjustable slipper clutch making it smooth to change gears without actually touching the clutch lever. 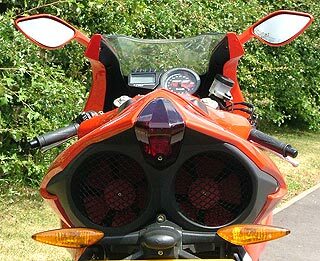 Blip the throttle and snick it in, nice and easy, except when you need to find neutral. There are two possibilities of finding neutral, get it as you come to a stop, or kill the engine and find it then. In talking with a couple of other owners I found out that it's a trait of this box, it's livable with, but in town it spoils it a little. The RS is a lot less heavy on your wrists than you may expect from this style of bike, and the wafer thin seat is not as bad as it looks either as it spreads the load well. The suspension is fairly firm to say the least and bumpy back roads are not a recommended place to ride, so get it out on those smoother 'A' and 'B' roads for the best results. The Benelli RS needs to be ridden out of town, on fast corners, on tight or flowing roads, it really doesn't mind, the more interesting the road the better as there's little need to change gear! There's a little over 11,500rpm to play with here, and there's also no noticeable point where you suddenly take off, it really is as flexible as that. At normal cruising speed the Tornado RS is running at a a very leisurely 4500rpm at 70mph in 6th, yet when you need to get past something or feel the urge for a little spurt up the road all you need do is twist the throttle and away she goes, solo or two-up makes little difference. In the Benelli spec sheet it says that this motor puts out a claimed 133 bhp, and in a recent head to head on track at Cadwell Park with our long term GSX-R 750 it felt about the same. There was really very little difference between them. The Benelli is smoother and a lot more progresive with its power delivery than the 4cyl, but in terms of 'chuckability' the GSX-R is at the head of the queue. The triple sounds fantastic when you open it up, the induction noise alone makes you keep it up over 7,000rpm, then it howls and just get faster and faster! 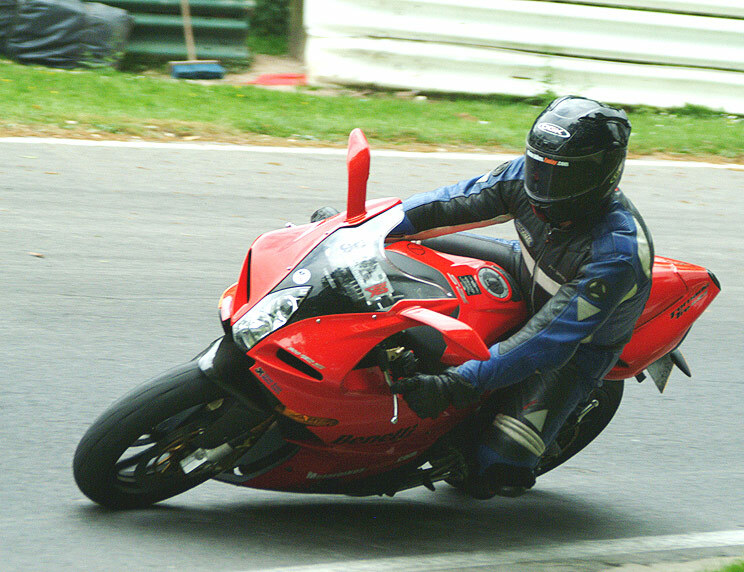 Having ridden quite a few miles on the roads over the course of a few days it was time to get to grips with the bike on a track, so off we went to Cadwell Park to try it out properly. The on-road handling so far was fantastic, what would it be like on a track at higher speeds? The Benelli suspension is a quality package that seemingly gets better and better the faster you go, but it also works well at low speeds to. The overall feeling you get from the bike is that it feel totally planted both front and rear at almost any speed, Benelli have definately got that difficult balancing act of combining easy, fast steering and a stable feel sorted out exceptionally well. The Marzocchi 50mm USD forks are perfect for this bike, combined with the “Extreme Technology” rear shock you get all the feel with absolute grip and stability, although on the road it does feel a bit stiff but liveable with. On the top yoke there's a “Extreme Technology”steering damper, but it in my personal opinion it's a fashion accessory more than a necessity as it really doesn't need it. I turned it down to its lowest setting on the road and it didn't need it at all on the track. 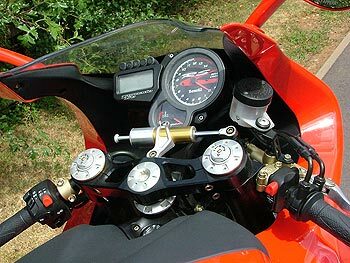 No matter what you did to the bike on acceleration or over bumps, there wasn't the faintest hint of a headshake, a wobble, in fact there was never a moment when the damper actually went to work. The same story comes when you talk about braking. Benelli have equipped the RS with Brembo Radial 320mm front brakes with 4 piston calipers which do the job with no fuss and perfect feel and progressiveness. On the road you never need more than a finger to haul you up from normal speeds, on the track add 1 more finger and you have the 'King of the late brakers'! The braided hose/Brembo radial caliper combo on the Benelli RS is another sign of the top quality kit that this bike has, a bike with near perfect braking feel and some serious stopping power when you need it the most. 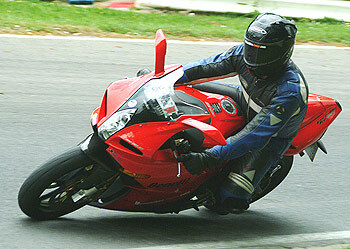 The Benelli Tornado RS is a pure sports bike designed for twisty roads fun. There are a few little things you will have to get used to, but in general its a fantastic bike with one sole purpose in life - to thrill! The riding position is perfect for sliding your arse off the seat and scraping your knee on the tarmac on almost any corner. The bars are just in the right place so they don't give you wrist ache over a distance, and believe me on one occasion I did over 400 miles up to Cadwell Park, rode on track all day then back home again without any aching wrists at all - mind you the seat is a bit hard after that amount of time and I did feel a little sore there! The Tornado RS is a real-world performance bike and will equal any offering from Japan and the its home country. 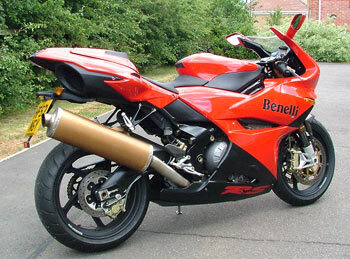 The real thing about the Benelli RS is it is unique and will draw crowds wherever it goes. It will suit poseurs and real riders alike, its a serious sports bike with fabulous looks and it also goes pretty damn well with it!